Heat oven to 350°F. In medium bowl, stir cookie mix, butter, egg and flour until dough forms. Divide dough into 6 equal portions, and color each portion with food color as desired. Roll 1 portion of dough on lightly floured surface to 1/4-inch thickness. Using 1 1/2-inch heart-shaped cutter, cut out 18 heart shapes. Cut 6 of the heart shapes in half for ears. Dip shapes into granulated sugar. Tuck ears under 6 of the heart shapes to form ears on bunny faces. Place all on ungreased cookie sheet. Repeat with remaining portions. Bake 5 to 7 minutes or until lightly golden brown. Mix frosting and powdered sugar. Set aside 2 tablespoons of the frosting. Spread frosting on bottom sides of heart shapes without ears. Top each with heart shape with ears. On lower back side of bunny, place dab of remaining 2 tablespoons frosting, and attach jelly bean for tail. In small microwavable bowl, microwave chocolate chips uncovered on High about 30 seconds or until chips can be stirred smooth. Place in small plastic food-storage bag. Cut small opening in 1 corner of bag. Squeeze plastic bag to make eyes and nose for each bunny. Let stand to set chocolate and frosting. 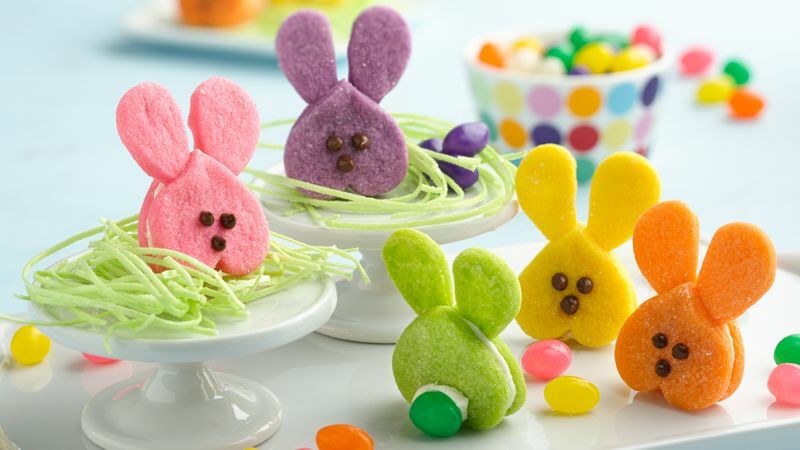 We suggest dividing the dough into 6 equal sections so you can color with food colors to make Easter bunny cookies in a rainbow of colors.